Madonna President & CEO Paul Dongilli, (left) and his wife, Marilyn Dongilli, (right), are long-time friends of Mary Carol Garrity, owner of Nell Hill's. Mary Carol was the featured speaker at the inaugural Dish and Bloom luncheon April 25, 2018. 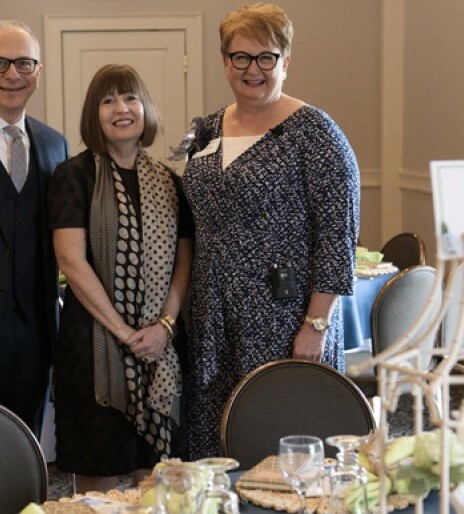 Mary Carol Garrity, interior designer and owner of Nell Hill’s, inspired more than 170 guests at the Country Club of Lincoln with her delightful conversation and incredible design inspiration at the Dish and Bloom Luncheon on April 25, 2018. The space was filled with admiration and amusement as Mary Carol shared tales of her interior design background, her recent move to a lakeside cottage and the journey of her interior design store located in Kansas City, Missouri. Mary Carol was graciously joined on stage with her long-time friend and Madonna employee, Marilyn Dongilli, who added to the insightful and fun conversation. Delicious food and drinks were served and guests left with smiling faces filled with innovative ideas on ways to update their own homes. Many guests also purchased the beautiful centerpieces from Nell Hill’s that adorned each table-top during the luncheon. It is safe to say that calendars were filled-up that afternoon with planned upcoming road trips to Kansas City to visit Nell Hill’s, after hearing Mary Carol’s unique and inviting accounts of interior design, along with the warm memories shared by fellow guests affectionately speaking about their favorite memories at Nell Hill’s. We are thankful to all who attended and helped us kick start this inaugural event in support of Madonna Rehabilitation Hospitals. We are already eagerly looking forward to next year’s Dish and Bloom event!